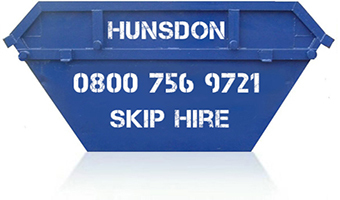 Hunsdon Skip Hire provide local skip waste containers for domestic or trade hire, with all sized Skips or large Roll-on-off Bins delivered and collected throughout Hertfordshire, London, Middlesex & surrounding Essex or Bedfordshire areas. Recycling & Waste management is based from our centrally located Recycle Transfer Station in Herts, but we have several local Skip distribution sites dedicated to local daily coverage. We provide cheapest local price quotes for Skip Hire, as well as a reliable and fast service. Don't use Skip Hire Agencies advertising 'lowest prices' on Google, or unlicenced waste carriers, you can deal with us direct and save money! Your local & regional waste recycle transfer station is managed by us. Trade, Commercial & Account disposals are accepted with our drive-in-out Weigh Bridge, which offer cheapest waste disposal costs. We recycle in the most cost effective ways in order to offer our very competitive prices. Recycling methods save costs on skiphire as well as provide the best rubbish disposal solution for our environment. We cover a large area and likely have a local Skip distribution station near you. Locations we cover daily for Skip hire include; Ware, Hertford, Stanstead Abbotts, Harlow, Hunsdon, Sawbridgeworth, Bishops Stortford, Takeley, Stansted Mountfitchet, Thundridge, Much Hadham, Standon, Puckeridge, Buntingford, Roydon, Hoddesdon, Broxbourne, Nazeing, Enfield, Cheshunt, Wormley, Turnford, Waltham Cross, Waltham Abbey, Cuffley, Goffs Oak, Epping, WGC, Welwyn Garden City, Hatfield, Welwyn, Watton at Stone, St Albans, Harpenden, Hitchin, Knebworth, Stapleford, Stevenage, etc. We also now have our dedicated North London Skip Hire team, covering areas such as Enfield, Edmonton, Tottenham, Chingford, Loughton, Ilford, Woodford, Barking, Walthamstow, Barnet, Finchley, Holloway, Islington, Harringay, Harrow, Wembley, Edgware, Borehamwood, Radlett, Shenley, Potters Bar, Southgate, and many other areas in between! There are often various options, so one quick call can solve it all. Skip Hire prices are always cheapest when tailored to your needs, whereas booking online anywhere means you pay a 'general' price. Trade or Domestic, Permits or not, wood, metal, brick or mixed, you will be best to speak directly with us for the lowest price. If outside office hours, or for convenience, you can still book online but perhaps use our contact form below and we will get back to you. Other local locations for Recycling, please call. Skip hire can be complicated even if we intend it to be simple. Do I need a permit? What can I put in skips? Please read below for answers to some commonly asked questions. What is the lowest price for skip hire? Skip Hire prices are lowest when tailored to you. Area, skip size, permit, waste type, payment method, vehicle access, regular trade, length of time required, are all examples of why it will be cheaper to telephone us for skiphire quotes and not just pay online. Some skip hire providers may advertise low, accept your money, then add costs once you are committed. We are genuine and will simply help without any pressure or hidden costs. Is Skip Hire cheaper if I'm a Builder or Rubbish Clearance operator? Local Traders are valuable to us, but equally so are individual Domestic skip users. We need all waste types to continue our recycling. Of course, if you are a regular user of waste skips you should discuss this with us, since we really are a leading local supplier of Trade Skip Hire for good reason. Skips are not always the cheapest way of disposing your waste, so choosing skip hire is often for convenience of removing large amounts of waste. If you deliver waste to one of our three recycling stations we offer weigh-bridge systems at the gate, so you can pay per ton for disposal. This saves the cost of skip hire and many local waste removal & skip companies use this service with us. We are an Authorised Waste Carrier and are fully licenced for waste transfer, management & disposal, as well as being regulated by the Environment Agency. Local Borough Councils use our services and we work daily obtaining waste permits from Authorities. Our large fleet of Transport at various locations also have further licences and tests for operations. We are well established and could not continue if standards were abused or criminal. What happens to rubbish that's put into skips? Not every Skip provider will recycle. However, our collected waste is processed through various stages and we have a large amount of machinery for recycling as much as possible. Our aim is always to send less to Landfill because of very high Government fees as well as the obvious fact that it's not good for this planet. You may discover that successful Skip companies are those recycling and those struggling are the ones still sending to Landfill. Our investment in recycling machinery has paid off as we continue to expand, even if our skip prices are beaten short-term, we are here to stay while others are closing down. Recycling your waste is the only way forward. You can make payment over the phone by Credit or Debit card, or by paying cash on delivery. Accounts are provided for Trade and Commercial users and we can accept direct Bank Transfers by discussing this with us first. Skip physical sizes are shown but waste can sometimes be difficult to estimate. If rubbish sacks or family car or small van does not suit, you are likely considering skip hire. In this instance, it is highly possible the small sizes of 2 or 4 Yard Skips will not suit either, they are only suited if you are fully aware of your needs. Skips 6, 7, 8, are the general medium sizes and many users will go for the standard 8 Yard Skip for most waste removal projects. Larger sizes such as 10 or 12 Yard would be more suitable for commercial waste or bigger home improvement projects. We also have 14 or 16 Yard sizes that are popular for development sites and large or ongoing home conversions. To be safe for collection and transport, the skip must be filled flat and level with the skip sides (or lower). We request that all heavy items should be spread evenly if possible, so that all the bulk of weight is not focussed to one side, end or corner. If you are disposing of any of the above, please give us a call so we can help you to find an alternative solution for waste disposal. You can call or email anytime to let us know you are ready. If your skip hire period is coming to an end we will try calling you to see how everything is going and will discuss a convenience of collection. Sometimes cheapest is not best suited and we advise caution. Saving 10 or 20 pounds might initially seem great but the reality is there will often be problems. Undisclosed tax suddenly added, costs for collection, unfair fines, there are many ways you can lose out with some alternative Skip Hire companies. We are genuine so it may not be possible to beat someone heading into liquidation. All we ask is that you give us a call and if we can't help then maybe remember us for your Skip Hire in future? Where can I get the cheapest quote for skip hire? Why are skip hire prices not shown? Are skip hire prices per week? Is there a price list for Skip Hire? Who is cheapest for skip hire? What is the price for skip hire? How much does a skip cost? Skip Hire price includes permit? The most common questions are about Skip prices but there are so many variables. To help, small skips will be 150 to 200, average sized often around 250 to 300 while large cost 300 to 350 and then you get extra large too at 400 or above. Road permits do cost and these can be 20 to 40 depending on Local Authority charges. Cheapest isn't always best so we aim to provide good service with lowest costs. With all sizes available for all areas we will have a Skip to suit your budget. How much does Skip Hire cost? SkipHire2 Prices for Skip Hire in Enfield? SkipHire4 How much for Skip Hire in Hertford? SkipHire6 What prices for Skip Hire in Harlow? SkipHire7 How much does a Skip cost? SkipHire8 What's the cheapest Skip Hire in Epping? SkipHire10 How much is Skip Hire in Hoddesdon? SkipHire12 What price is Skip Hire in Stevenage? SkipHire14 How much for Skip Hire in Bishops Stortford? SkipHire16 What price is Skip Hire in London? What skip permit and how much do skip permits cost? SkipHire20 Lowest prices for Skip Hire in Welwyn Garden City? SkipHire25 Cheapest prices for Skip Hire in Hatfield? SkipHire30 How much does Skip Hire in St Albans cost? SkipHire40 Who has cheapest price Skip Hire cost in Herts? Quote on how much it costs for Skip Hire?